The Milwaukee Brewers will be once again hosting a Law Enforcement Appreciation Night at Miller Park. This years game will be on Friday August 11th against the Cincinnati Reds with a game time of 7:10pm. 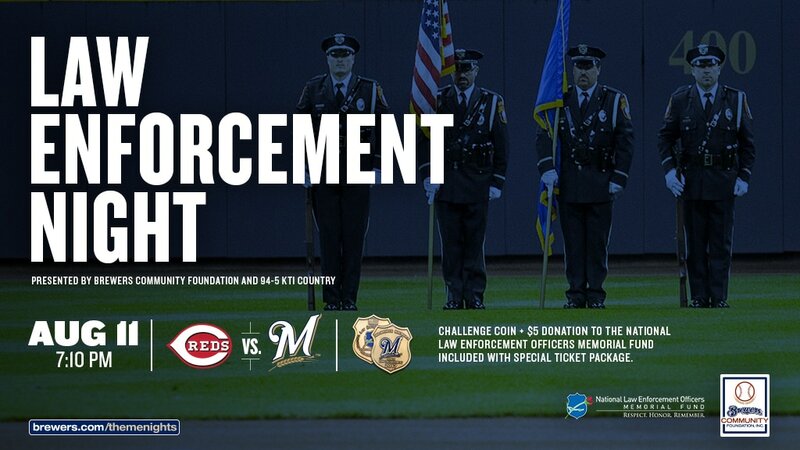 Due to the large number of participants the Milwaukee Brewers cannot provide tickets for the participants but they are offered at a discounted price with $5.00 from each ticket sold going to the National Law Enforcement Fund. You can purchase tickets through the link below. Tickets purchased through this package will also receive a Brewers Law Enforcement Night Challenge Coin.